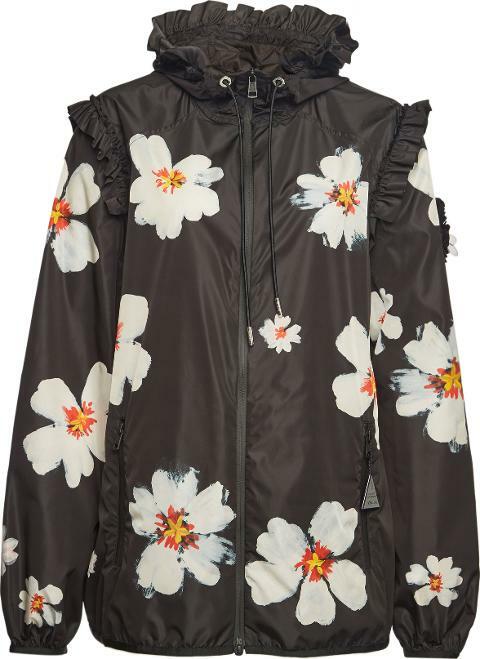 Moncler Genius 4 Moncler Simone Rocha Printed Zipped Jacket with Ruffles. In matte black with floral motifs, this zipped jacket is a statement layer from Moncler Simone Rocha, collection no4 of the Moncler Genius project. Lightweight with feminine ruffles and the brand's iconic logo, wear it next to jeans or dresses it has plenty of styling potential. In matte black with floral motifs, this zipped jacket is a statement layer from Moncler Simone Rocha, collection no4 of the Moncler Genius project. Lightweight with feminine ruffles and the brand's iconic logo, wear it next to jeans or dresses it has plenty of styling potential.